Sterling Silver / 14K Gold Diamond Starfish Ring.0.130ct Price includes 30% discount. Shine like a star the moment you slip on this flattering seascape design. 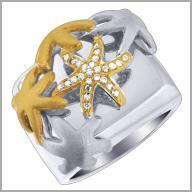 This starfish ring is crafted in polished and satin sterling silver and 14K yellow gold accents. It features 26 full round cut diamonds in prong settings. The total diamond weight is approximately 0.13ct with a color of H-I and a clarity of I1. The setting size is 11/16" x 13/16" with a height of 5/16"
I loved this ring when it was offered on Shop NBC, but it sold out so quickly in my size I was not able to purchase one. It is whimsical, well constructed, and just a really fun ring to wear and own. 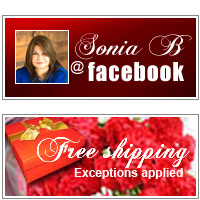 As with all of Sonia's pieces, you will not be disappointed if this one catches your fancy! Happy to add it to my "Sonia" collection of beautiful pieces.